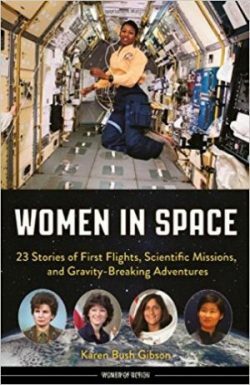 DESCRIPTION FROM THE PUBLISHER: Women in Space profiles 23 pioneers, including Eileen Collins, the first woman to command the space shuttle; Peggy Whitson, who logged more than a year in orbit aboard the International Space Station; and Mae Jemison, the first African American woman in space; as well as astronauts from Japan, Canada, Italy, South Korea, France, and more. Readers will also learn about the Mercury 13, American women selected by NASA in the late 1950s to train for spaceflight. Though they matched and sometimes surpassed their male counterparts in performance, they were ultimately denied the opportunity to head out to the launching pad. Their story, and the stories of the pilots, physicists, and doctors who followed them, demonstrate the vital role women have played in the quest for scientific understanding. IDEAS FOR USE: Read this book and then check out our profiles of some of the women featured, using them as a basis for further research.